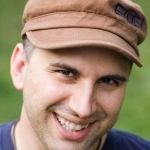 Peterson Toscano » A Quaker Comic Minstrel Show–Not in my Town! 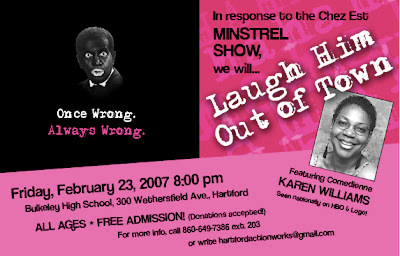 A Quaker Comic Minstrel Show–Not in my Town! Something is terribly wrong is happening right now in the white gay community in Hartford, CT (where I live). A white drag queen (who identifies, by the way as a Quaker Minister) is coming to Hartford in ‘blackface’ as a welfare mom with 17 children, calling herself Shirley Q. Liquor. And many (but not all) white gay men do not see a problem with this. As a Quaker, as a white man, as a gay man, as a comic performer who plays many characters including Black women, I can say that this is wrong on so many levels. That the performer and the venue will not back down or listen to reason, reveals the arrogance and ignorance so often among privileged white gay men. We cry victim because of how we have been oppressed, yet we refuse to see the oppression of others and our own contribution to that oppression. Local activists (mostly young people) have begun actions including a myspace page Ban Shirley Q. The local press has covered the story. And True Colors, an LGBTIQ organization for youth has organized an anti-racism show featuring Karen Williams. I will also attend at the event. The local Quakers are gathering to organize a response from the meeting. Shirley Q performs around the US, so even if you don’t live near Hartford, join the myspace page and stay aware and vocal. Too often white gay men have sat back and contributed indirectly and directly to racism and the advancement of white skin privilege and the oppression of women. If we stand up and speak out something terribly good can happen in Hartford and beyond. Shirley Q. Liquor is still stirring up controversy, I see. I remember her coming to Boston some years ago when I lived there, and there was an uproar. It was boycotted, so I don’t know how many people attended it, but you could rest assured that good old Boston let the show go on. It’s kind of like when that comedian ranted about n—s on stage, and people still said he wasn’t racist — just angry. Can’t people see what’s right in front of them? The easiest way to hide something is right out in the open.